Home ⁄ Frequently Asked Questions ⁄ Can CLEARFIL MAJESTY ES Flow be used for Class I and Class II procedures? Can CLEARFIL MAJESTY ES Flow be used for Class I and Class II procedures? CLEARFIL MAJESTY ES Flow can be used for direct restorations for all cavity classes, cervical lesions, tooth wear and tooth erosion? 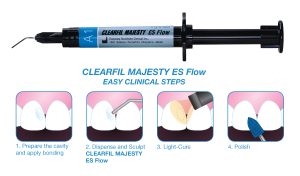 CLEARFIL MAJESTY ES Flow is a light-cure, universal flowable composite that is indicated as a direct restorative for all cavity classifications, cervical lesions, tooth wear and tooth erosion. It is exceptionally easy to polish in just a few seconds. A high level gloss can be achieved by simply wiping the cured CLEARFIL MAJESTY ES Flow resin with a gauze or cotton roll soaked in ethanol. The high filler loading of 75 wt% contributes to superior mechanical properties and durability. The composite is non-sticky and offers virtually bubble-free dispensing. Available in 10 shades, use CLEARFIL MAJESTY ES Flow for all your restorative applications! !